The Communication Workers Union (CWU) has called off all postal strikes until at least the New Year to allow for fresh talks with the Royal Mail. Both sides said the move will allow for a "period of calm", in which they hope to be able to formulate a long-term agreement to end their dispute over redundancies, and pay and working conditions. Although further strikes have been averted for the time being, the two sides are still a long way from reaching a final deal. CWU deputy general secretary Dave Ward has admitted that it "will take exceptional efforts to rebuild trust", adding that the mood between the two sides is "bitter". However, he added that "we will work very hard to ensure that the agreement stays on track". Talks between Royal Mail bosses and CWU leaders will now continue over the coming months with the support of the conciliation service Acas. An independent person will also be appointed to oversee the "detailed negotiations", although it is not yet known who this will be. What about the union's planned legal action? The CWU had been due to go to the High Court on Friday to seek an injunction preventing the Royal Mail from using temporary workers to clear the backlog from the recent five days of nationwide strikes. The union said the Royal Mail was illegally using the temporary staff to break the strike, something Royal Mail strongly denied. The CWU has now called off this legal action. What is at the centre of the dispute? 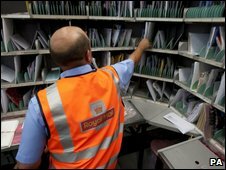 The CWU agrees that the Royal Mail needs to cut jobs as part of its modernisation plans, but disagrees over their extent. It says it is also concerned about the future pay and working conditions of those staff that remain. At the heart of the dispute is the deal that the two sides signed to end the last national strike, the 2007 Pay and Modernisation Agreement. The CWU says that Royal Mail has carried out three of the four planned phases of that agreement with full and frank dialogue. It claims the company is refusing to talk to it about the final phase, dealing with how the roll-out of its modernisation plans would affect job security. One aspect of this modernisation involves the walk sequencing machine, a device which organises letters into the order the postmen and women will deliver them the next morning. The CWU fears the national roll-out of this machine will mean thousands of full-time jobs will go, and that there will be a massive increase in the number of part-time workers. The CWU argues that even though it agreed in 2007 that jobs would need to be lost as part of the plan, specific details about the actual nature of the modernisations were unknown at that time. It claims that when Royal Mail stopped talking to staff or the unions about the long-term effects on job security, it had no choice but to threaten a strike in order to get discussions moving again. Royal Mail argues that it did not stop talking to the union about the future strategy of the business. It insists that where local staffing level changes are concerned, it has agreed that proposals should be transparent - and that it has been discussing with the union how it can give people more confidence in this area. Why is Royal Mail making the changes? Royal Mail says the number of letters and parcels which its core business delivers are falling by 10% each year, losing it £170m a year. To respond to this decline in business, it says staffing cuts are inevitable. In 2008, the Royal Mail Group went into the black for the first time in 20 years and profit at the main letters and packages unit was £58m from a turnover of £6.7bn. Royal Mail says this margin is very small considering the size of the turnover. The group also has a £6.8bn pensions deficit. The CWU has repeatedly called on the government to intervene to help reduce this deficit, something the government has refused to do.